Otterbein E. PADDACK (1874-1942) was the son of Charles Rollin PADDACK (1839-1923) and his first wife Mary R. McCREARY (1837-1895). Charles was the son of Tristam PADDOCK and Charlotte PALMER. 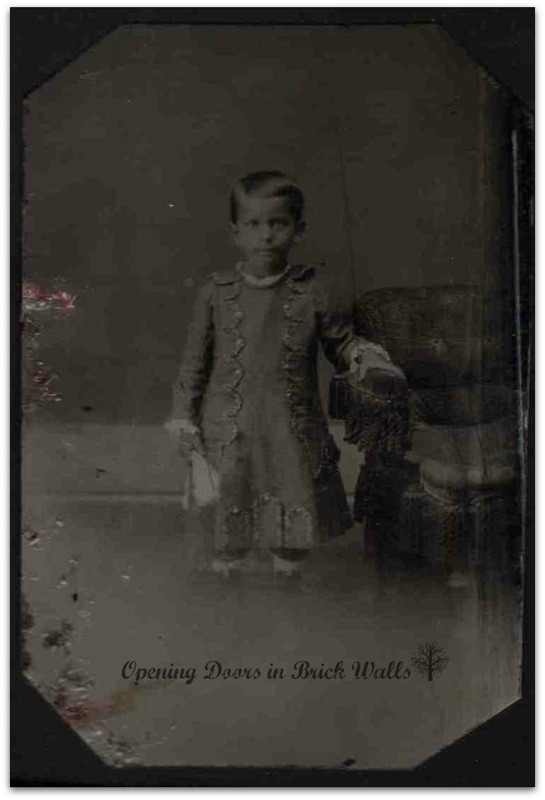 Otterbein and his father spelled their surname with an a instead of an o.
Otterbein, born 7 June 1874, was photographed in the late 1870s in a below the knee length dress/coat with lacy ruffles at the sleeve openings and neck. It looks like he may be wearing calf length pants under the dress/coat also with ruffles at the leg openings or where they are tucked into boots. He has a handkerchief in one hand. On his World War I draft card his physical description was blue eyes, black hair, tall and medium build. One can “see” the blue eyes in this tinplate which was labeled with his name on the back. I found a photo of Otterbein with his second wife, and two children online. It is a postcard view of Otterbein Paddack’s Grocery at 2800 S. Walnut in May 1916. The postcard shows Otterbein, his wife Elizabeth, and children. It was mailed to Otterbein’s father, Rev. C. R. Paddack, of Liberty, Indiana. I wondered about the spelling of the surname when I wrote 52 Ancestors: #51 Nice. How I Opened the Door in Cousin Joe’s Brick Wall and quoted the first part of a genealogical sketch on Rev. Charles R. PADDACK and his ancestry. In the postcard view of Otterbein’s grocery store, one can see the spelling of the name in the window. 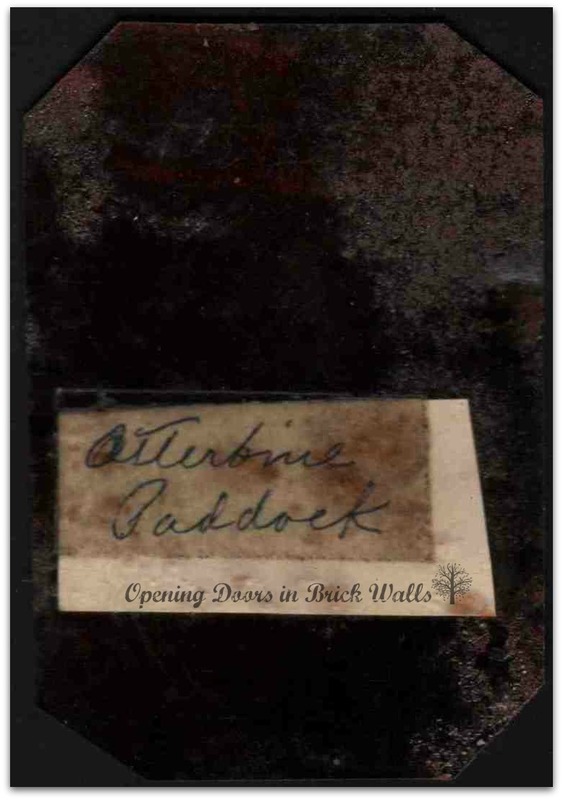 Census records for Otterbein and his father Charles show they used the spelling of PADDACK instead of PADDOCK. Mr. Paddack married first, November 25, 1866, Miss Mary B. McCreary, daughter of John and Mary T. (Williams) McCreary, who was born in Center township. She died March 10, 1895. Their children were: Markwood, Otterbein and Lawrence Dillon, the last named dying in infancy. Mr. Paddack married secondly, on March 27, 1898, Cassandra Elina Lee, daughter of Isaac K. and Anna C. (Glidewell) Lee, a native of Salt Creek township, Franklin county. 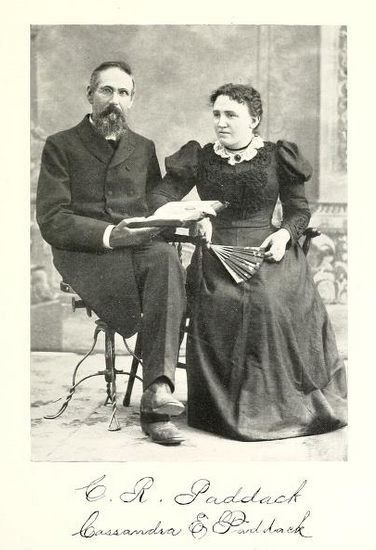 Included in the book was this photograph of Charles R. PADDACK and his second wife Cassandra. This was the last of the PADDOCK/PADDACK photographs. and links to previous posts in the series can be found here. Opening Doors in Brick Walls. He’s cute and SO stylish! Happy New Year to you Cathy!! Happy New Year to you too Laura! Next Next post: In 2016 I’m Going To….